Today's So Shoe Me is the Mild Case Boot by Degen, $320, available at Solestruck. The future is coming so be prepped and ready in these funky saw-tooth soles hiking boots. Take a bite out of conventional style with these signature soled boots. 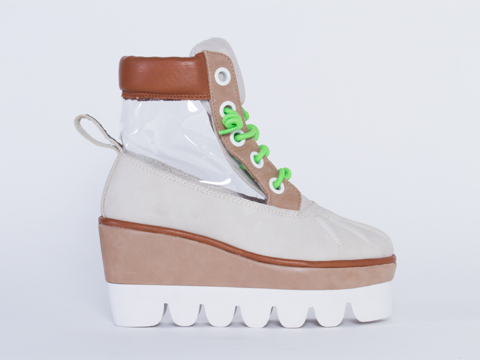 A transparent panel and neon green laces add a futuristic touch to these lace-up ankle boots. Some classic details like the leather collar and lace-up front are a nod to the everyday hiking boot but the super sized saw tooth sole adds a modern kick. So step up your style in these new school boots and some medicinal print leggings for a smoking pre-fall look. So Shoe Me a pair of transparent trippin' boots that will add a signature sole to my everyday separates this fall.